Tilt your twenty dollar note to see if the numeral 20 in the lower right corner on the front of the bill changes color from copper to green. 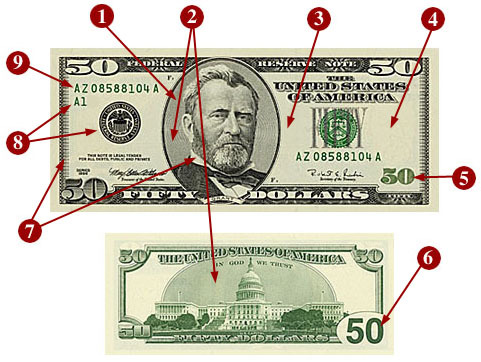 The color shift is more dramatic in the redesigned currency, making it easier for people to check their money. Hold the twenty dollar note to light and look for the security thread that is embedded in the paper and runs vertically up one side of the bill. If you look closely, the words USA TWENTY and a small flag are visible along the thread from both sides of the bill. The security thread glows green when illuminated by ultraviolet light. Appearing on the front of the bill are two American eagle symbols of freedom. The large blue eagle in the background to the left of President Andrew Jackson’s portrait is representative of those drawn and sculpted during his time period. The smaller green metallic eagle to the lower right of the portrait is a more contemporary illustration, using the same raised ink intaglio process as the portrait, numerals and engravings. The symbols of freedom differ for each denomination. Because they are so small, micro printed words are hard to replicate. 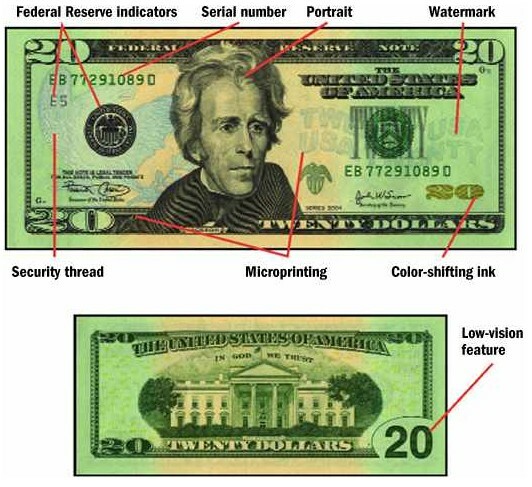 The redesigned $20 bill features microprinting on the front of the bill in two areas: bordering the first three letters of the TWENTY USA ribbon to the right of the portrait, the inscription USA20 is printed in blue. THE UNITED STATES OF AMERICA 20 USA 20 appears in black on the border below the Treasurer’s signature. 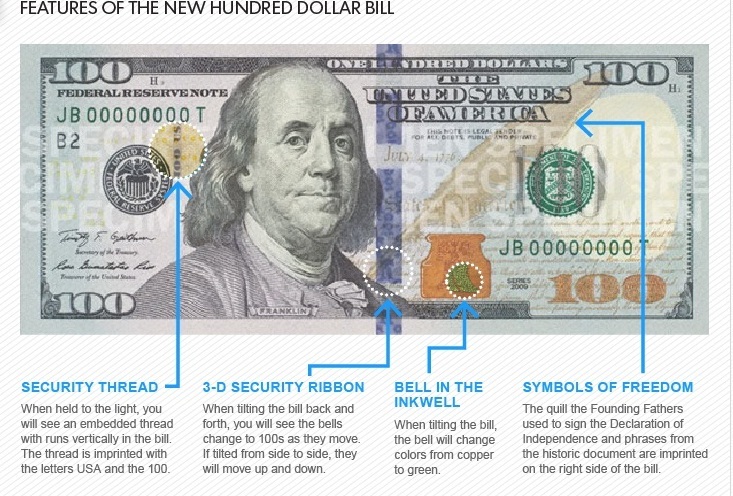 Look for a blue ribbon on the front of the 100 US dollar bill. Tilt the note back and forth while focusing on the blue ribbon. You will see the bells change to 100s as they move. When you tilt the note back and forth, the bells and 100s move side to side. If you tilt it side to side, they move up and down. The ribbon is woven into the paper, not printed on it. 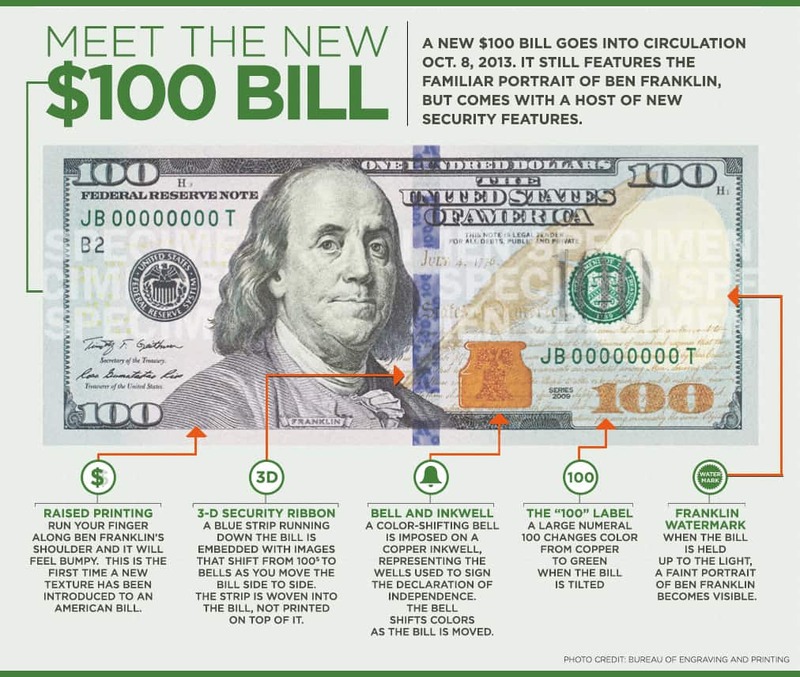 Look for an image of a color-shifting bell, inside a copper-colored inkwell, on the front of the new 100 US dollar bill. Tilt it to see the bell change from copper to green, an effect which makes the bell seem to appear and disappear within the inkwell. Tilt the note to see the numeral 100 in the lower right corner of the note shift from copper to green. Hold the note to light and look for a faint image of Benjamin Franklin in the blank space to the right of the portrait. The watermark is visible from either side of the note. Hold the note to light to see an embedded thread that runs vertically to the left of the portrait. The thread is imprinted with the letters USA and the numeral 100 in an alternating pattern and is visible along the thread from both sides of the note. The thread glows pink when illuminated by ultraviolet light.